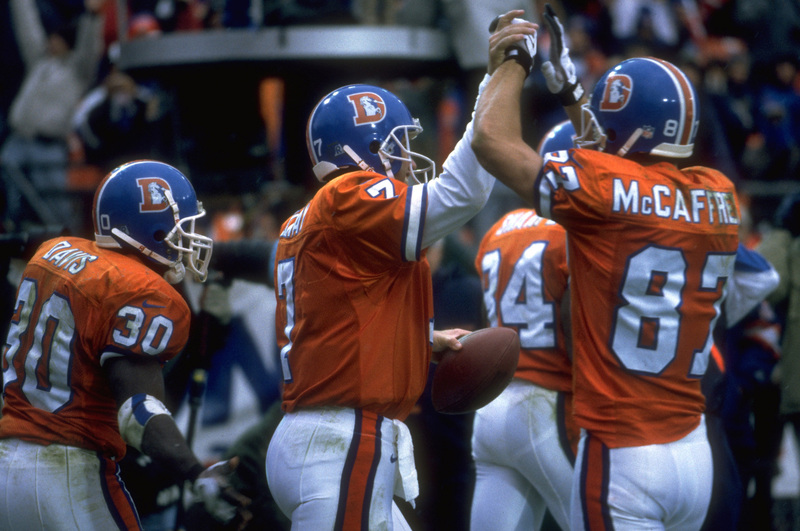 Quarterback John Elway and receiver Ed McCaffrey celebrate after connecting for a touchdown during an October 20, 1996 win (45-34) over the Baltimore Ravens. As the Broncos concluded a season that saw them win a then-franchise-record 13 regular-season games, the honors piled up. QB John Elway becomes just the third player in NFL history to pass for more than 45,000 yards in a career. Terrell Davis wins the AFC rushing crown with a then franchise-record 1,538 yards while also posting franchise bests in carries (345), rushing touchdowns (13) and total touchdowns (15). The team ties for the NFL’s best record (13-3; ties for best in franchise history) and ranks first in the league in total offense and rushing offense as well as fourth in total defense, including a No. 1 mark against the run. Franchise records are set for points scored (391), highest average gain per rush (4.5; tie with 1995 team), fewest rushing yards allowed (1,331) and fewest rushing first downs allowed (67).